This is a special challenge for me as it is the first one I have hosted for Fussy & Fancy Challenge ... so I am really looking forward to seeing everyone else's take on the Black and Blue theme. I wasn't even planning on making a challenge card today but I decided to play with the new Stamps Away Peacock mask. My sister sent me the most beautiful birthday card using this technique .. I coated the mask with perfect medium then carefully put it through my Grand Calibur using the sandwich usually used for cutting (no tan mat) I just wanted the pressure to transfer the sticky Perfect Medium onto the black Clarity glossy card. I then sprinkled the card with Stampendous Kaleidoscope embossing powder ..this is the most beautiful powder because when you heat it the colour changes through the rainbow colours the longer you heat it, I stopped just as the colours were changing from blue to green. I was quite pleased with the end result.. but then what to do with it. That's when I remembered the Black & Blue Challenge ... 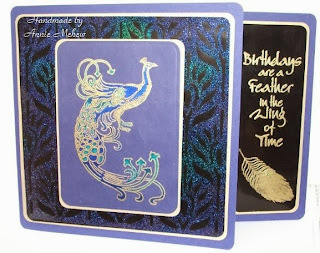 I stamped Sam Poole's lovely deco Peacock onto blue card and gold embossed it and coloured it with Cosmic Shimmer drawing inks which are full of shimmery mica. When it came to the sentiment I knew exactly what was needed Clarity Wings of Time stamp... I then had to concoct a card shape to put all my bits and pieces on, I used a sheet of A3 royal blue and cut it down and folded it so that the back was longer than the front so that the sentiment is glued onto the back of the card but still shows from the front. So that's my version hope you'll get your crafty stash out and have a play and see what you come up with. Entering the challenge is easy just go over to the F&F Challenge page here: http://fussyandfancychallenge.blogspot.co.uk/ and the links are there. This is just GORGEOUS Annie!! You are true to your background with your very creative mind!! Hi Annie! Your card is absolutely GORGEOUS! 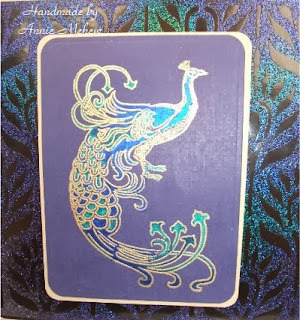 The kaleidoscope embossing powder that you used for your lovely background sounds really intriguing! I need to look into that! 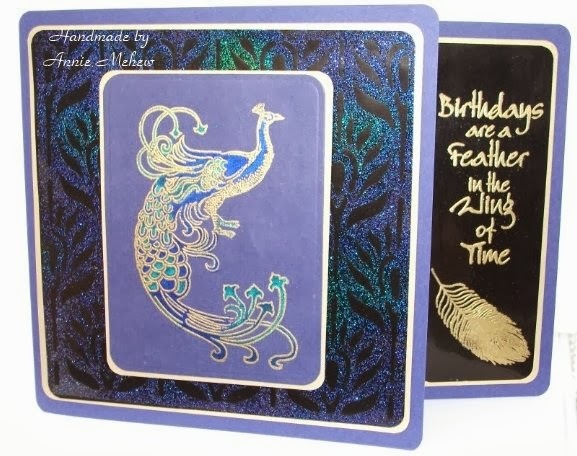 And those cosmic shimmer drawing inks worked perfectly in your lovely gold embossed peacock! Congratulations for hosting such a fun challenge!